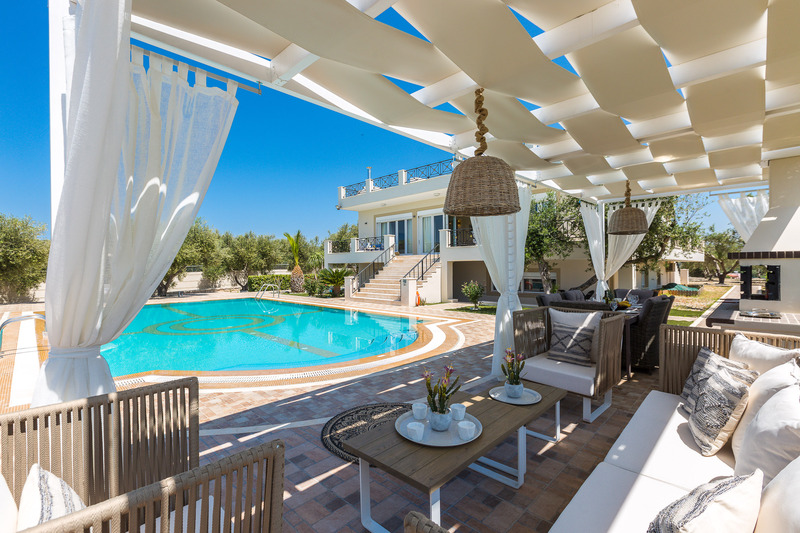 Villa Daphne is a luxurious villa that offers total privacy, numerous facilities, private indoor and outdoor swimming pools, gym equipment, toys and numerous dining and siting areas. 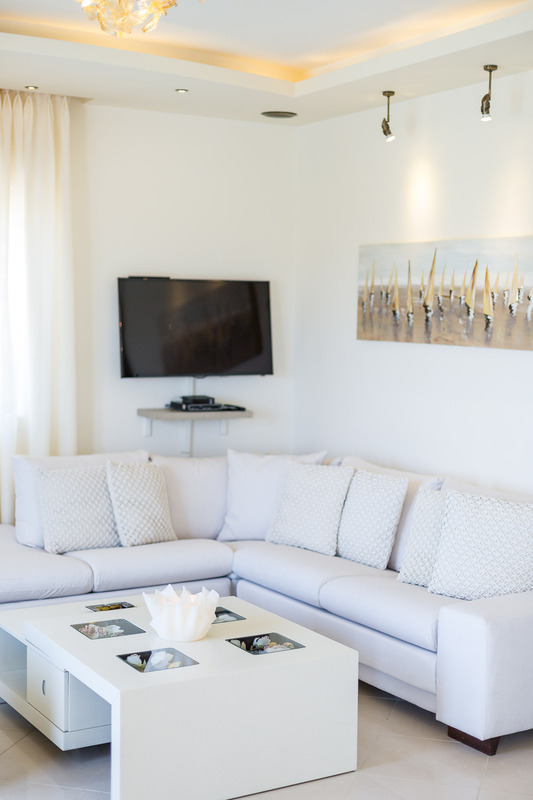 At the same time is conveniently located very close to the beach and all kinds of shops! 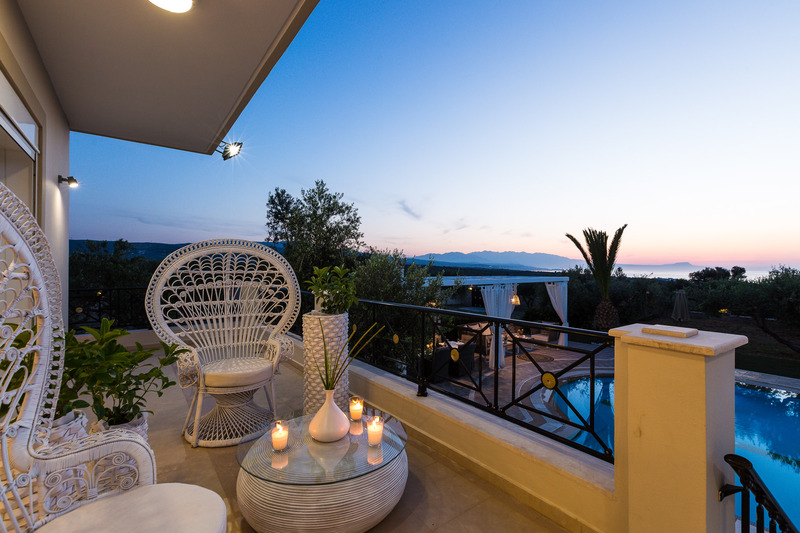 If you believe that accommodation is a major factor in aiding a unique holiday experience then Villa Daphne is exactly what you are looking for! 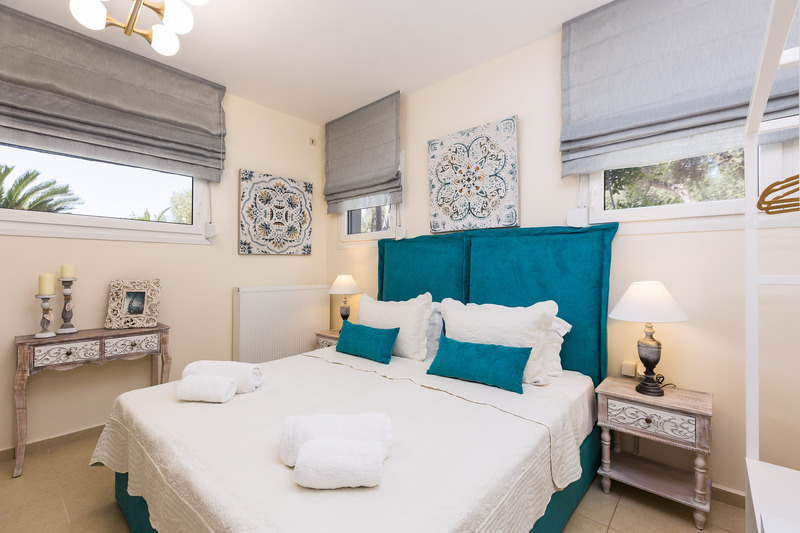 The remaining three bedrooms of the Villa can be found on the ground floor, two of which feature a double bed each, while the last one has two single beds. 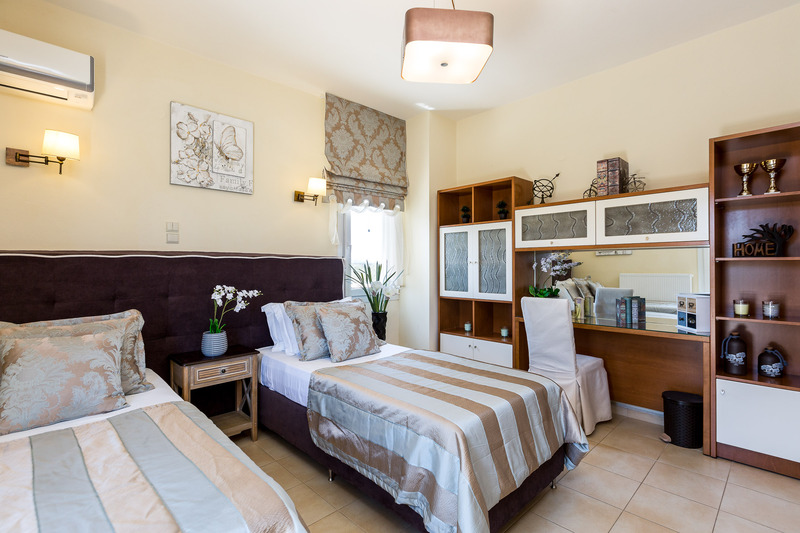 If needed, the single beds in the bedrooms can be converted to double beds with a double bed size mattress topper. 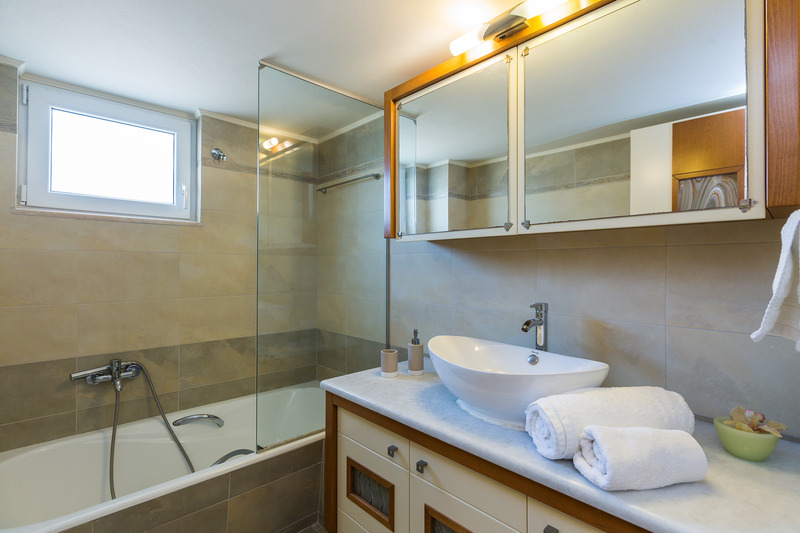 Furthermore, a second kitchen and an additional bathroom with a bathtub can be found on this floor, providing independence and privacy to large groups when required. 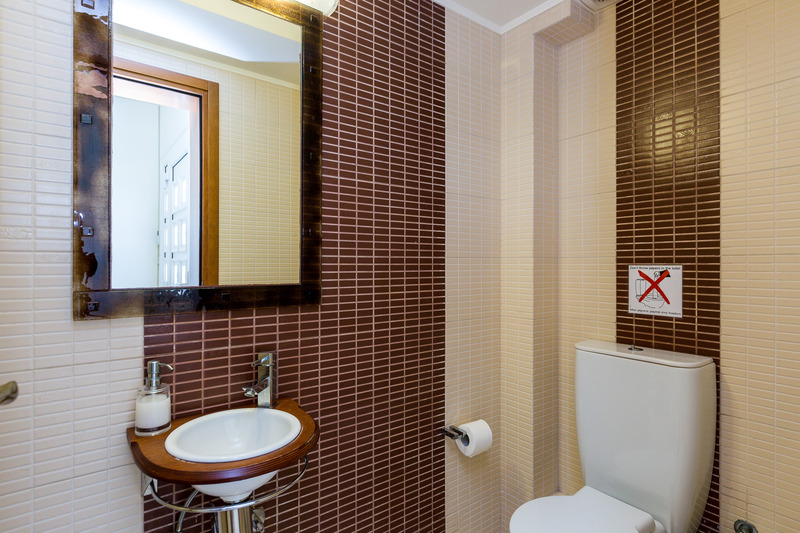 Last but not least, the ground floor boasts an indoor,15 sq. 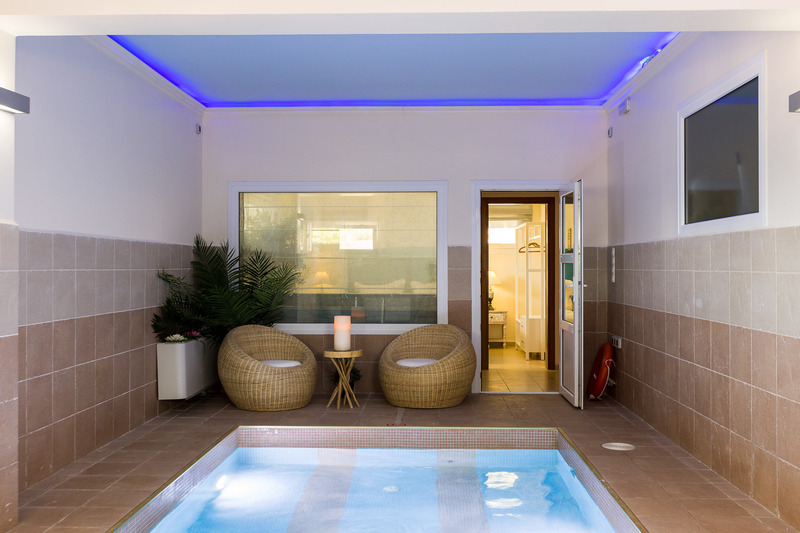 m. swimming pool, which also functions as a Jacuzzi and can be heated if required. 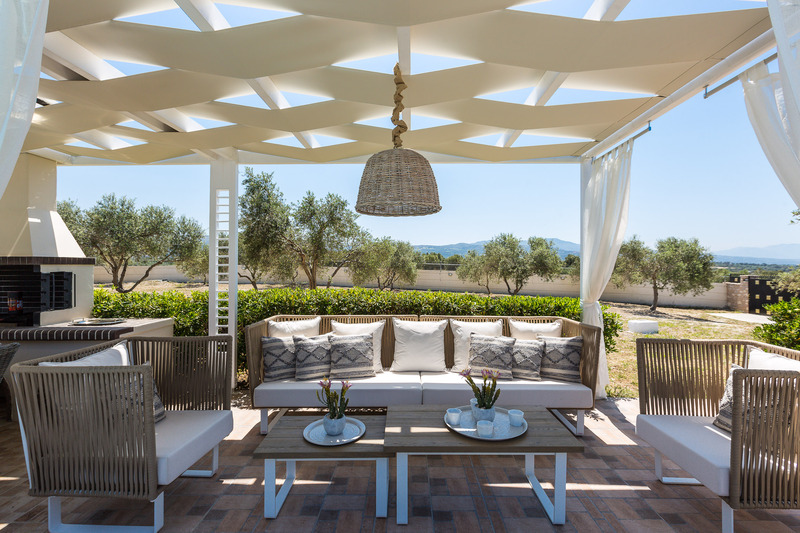 The terrace of Villa Daphne is complemented by a huge 100 sq. 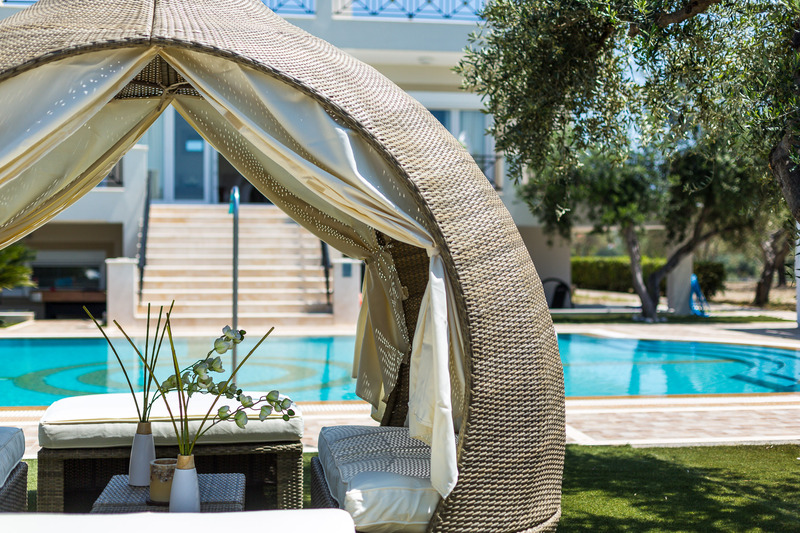 m swimming pool, equipped with sun beds and umbrellas for your comfort. 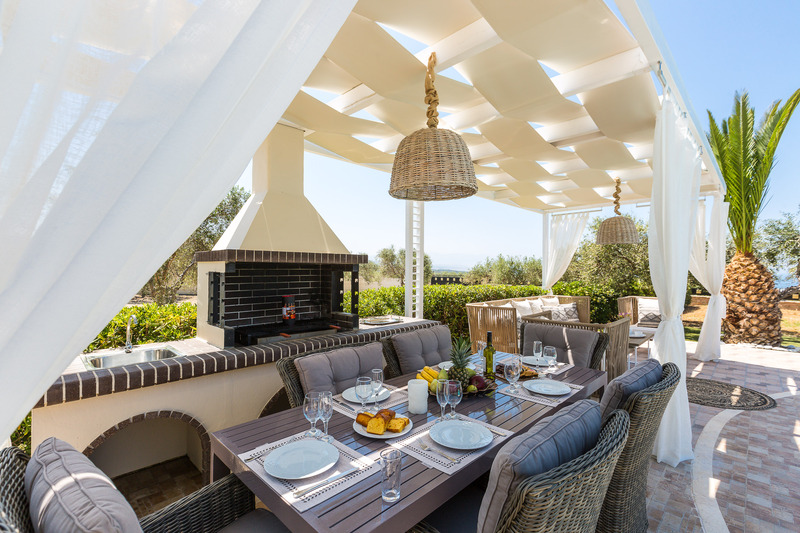 Barbecue facilities and an outdoor dining table under the shade of the pergola give you ample opportunity to try al fresco dining, while an extra shaded siting area and a gazebo are also available. 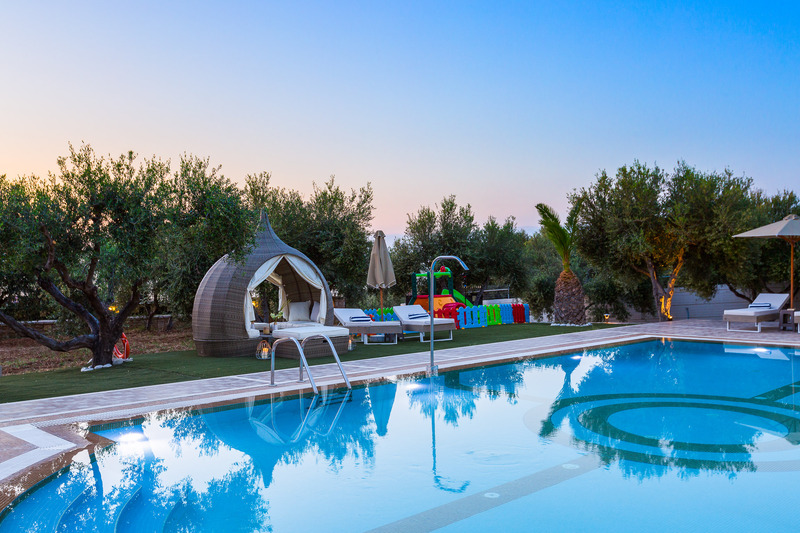 On the other side of the pool a lawn covered area with a playground and toys under the olive trees is at the disposal of our young guests, while on a covered part of the ground floor veranda, by the pool, an air hockey, mini football table, as well as gym equipment including a bicycle, wights and an exercise bench. 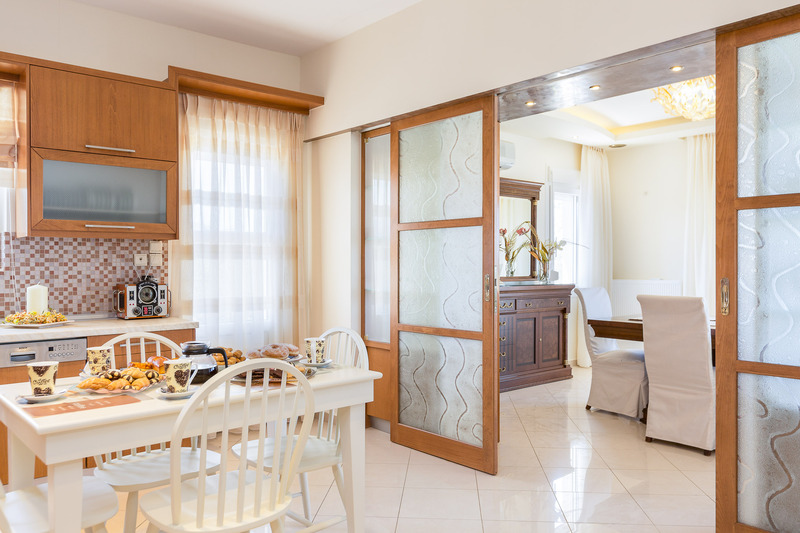 The whole area is fenced and secured with an alarm system offering our guests safety and privacy! 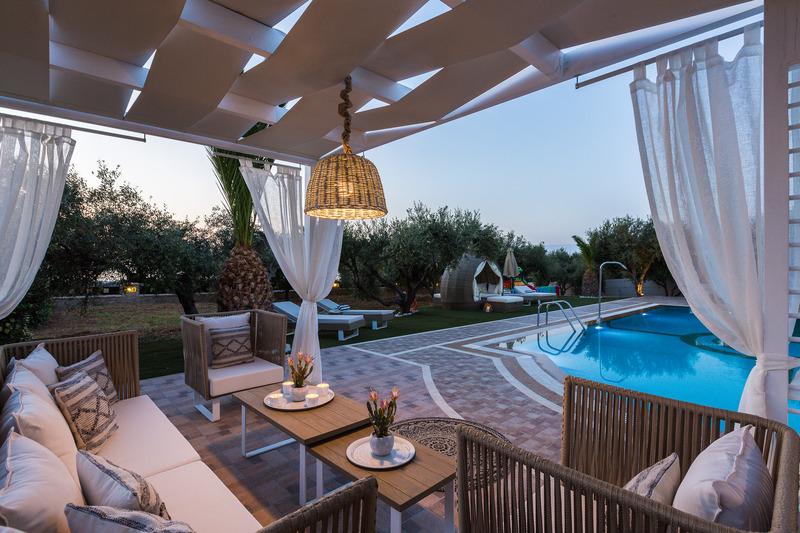 Staying in villa Daphne you will have advantages that only a few villas can offer you around Crete! 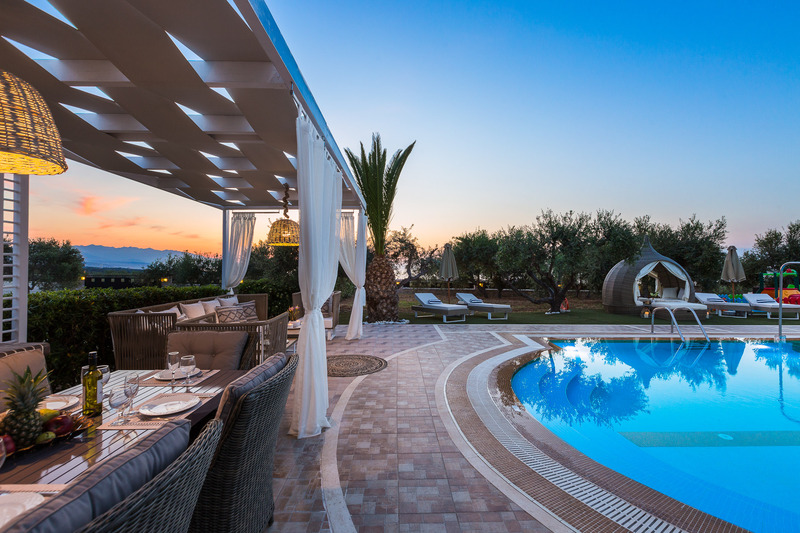 Staying in villa Daphne you will have advantages that only a few villas can offer you around Crete! 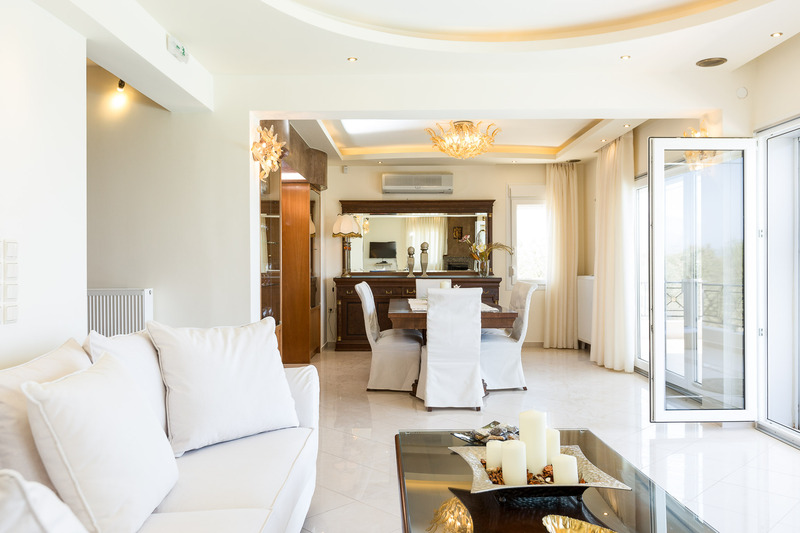 - Luxury in every detail in a fully functional house! 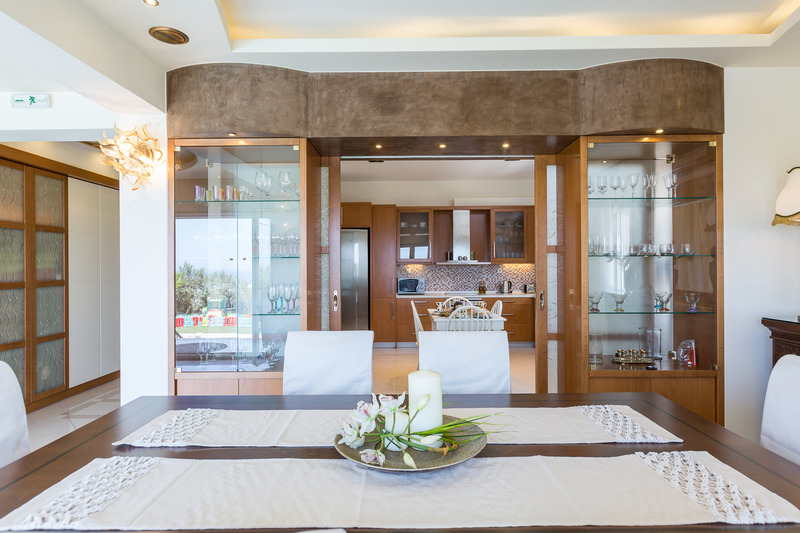 - Total privacy in both the indoor and outdoor areas as the villa is located in a 4,000 sq. m. highly fenced olive grove. - Surrounded by nature! The closest neighbouring house is almost 500m away. 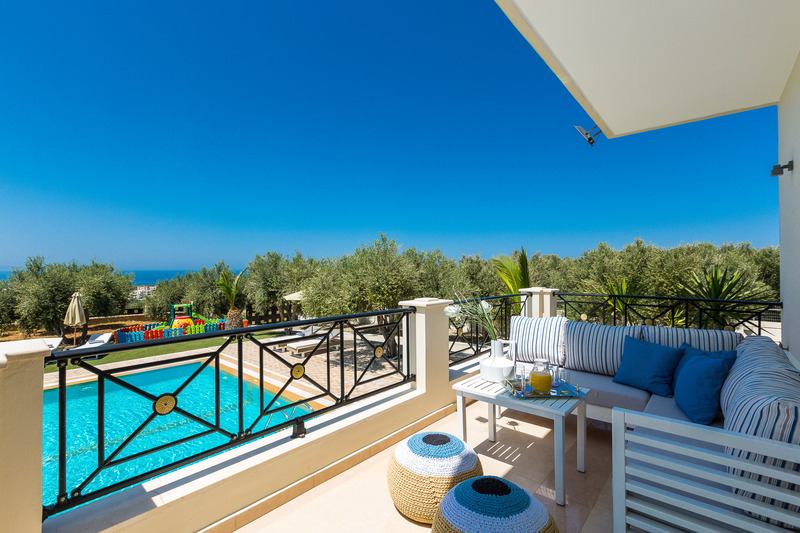 - Close to the beach! Less than 1.5 km from the sandy beach of Sfakaki. 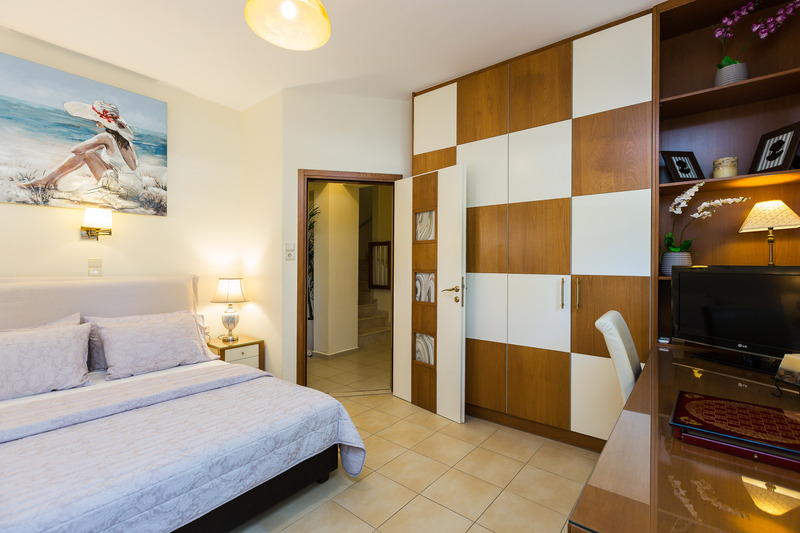 - Close to residential areas where you can find everything! 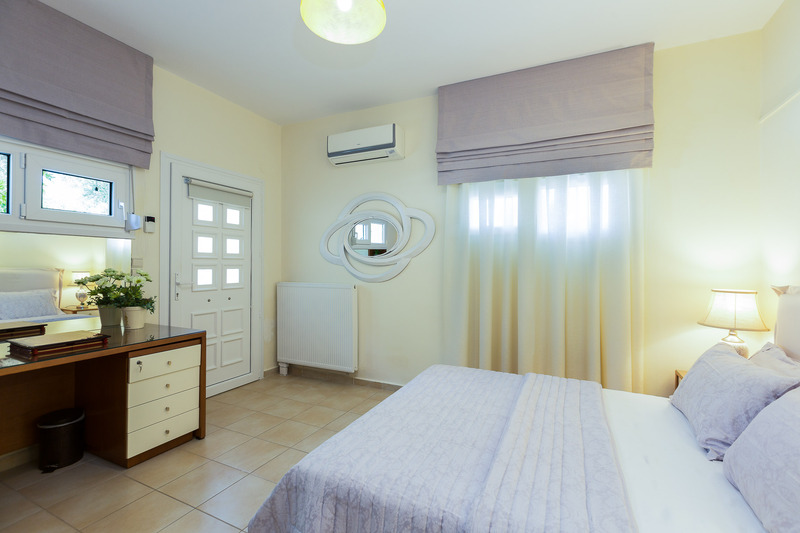 Sfakaki market is about 1 km away while Platanias and Adelianos Kampos are approximately 5 km away. - Close to the Traditional village Pagkalochori just 500 m walking distance. - Sea and sunset views! 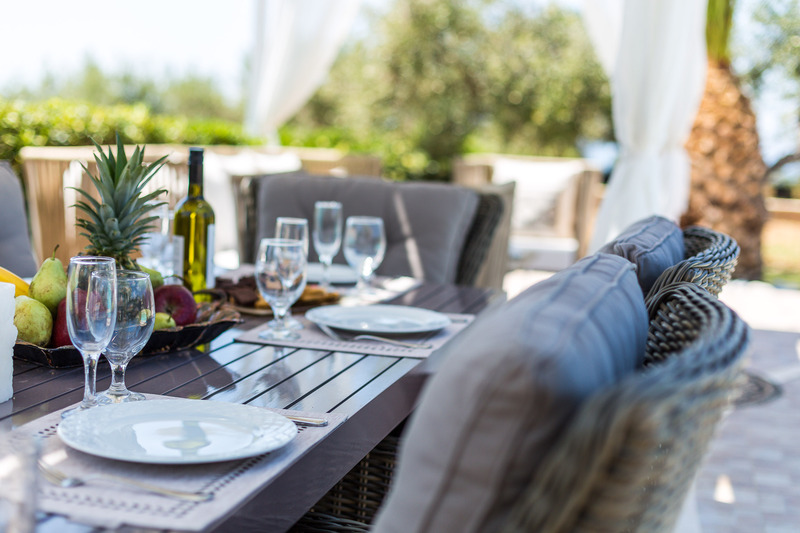 - A large outdoor 100 sq. m. swimming pool and a 15 sq. 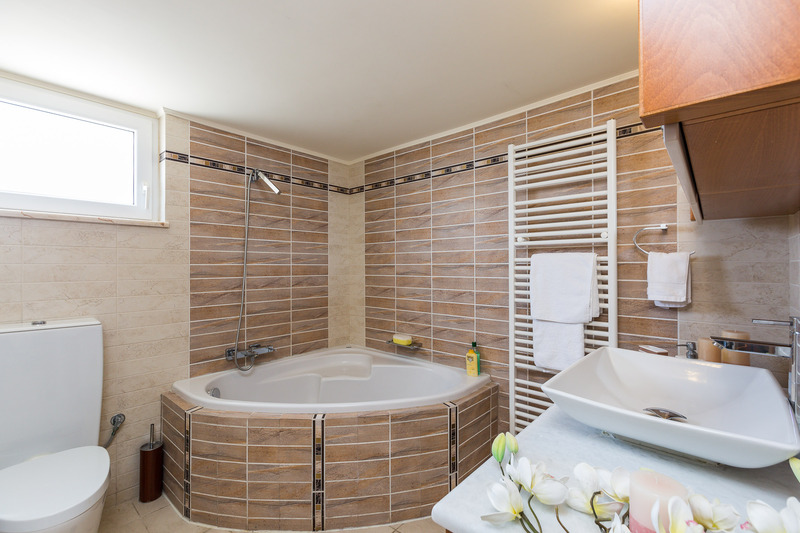 m. indoor swimming pool with Jacuzzi! 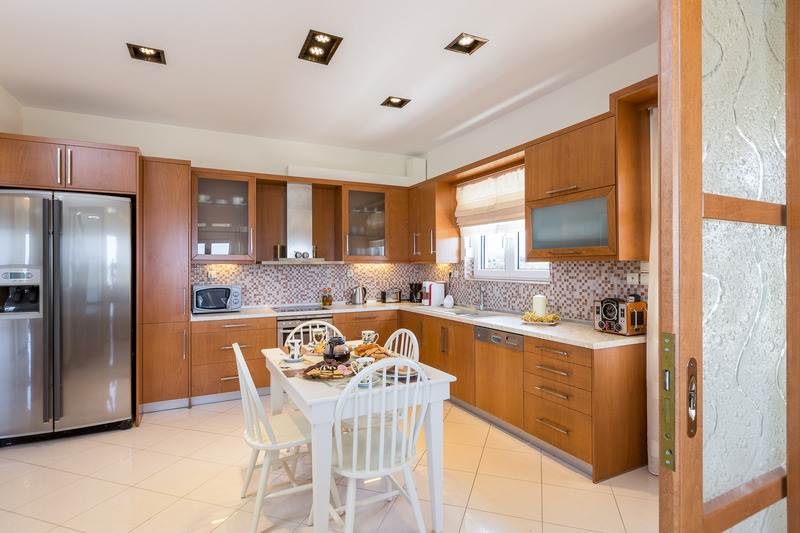 - One kitchen on each floor allowing privacy amongst your own group and making each floor more independent. 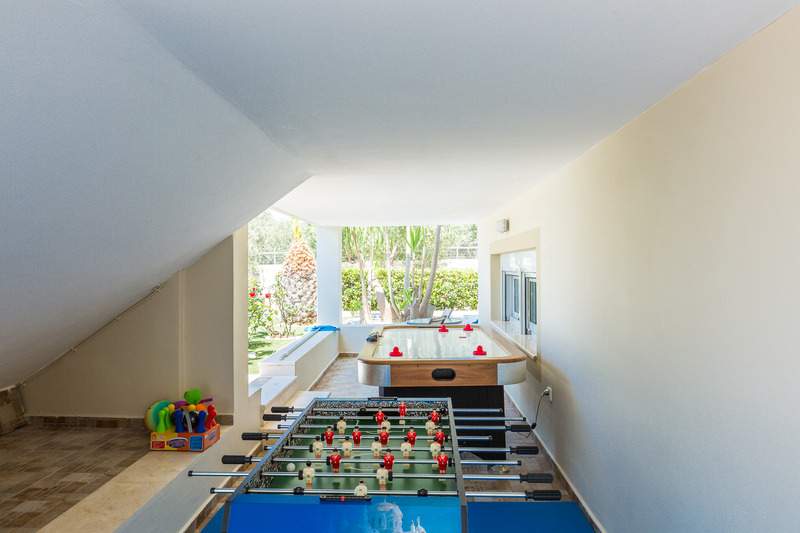 - A playroom for teenagers and young children. - A garden-park for children. 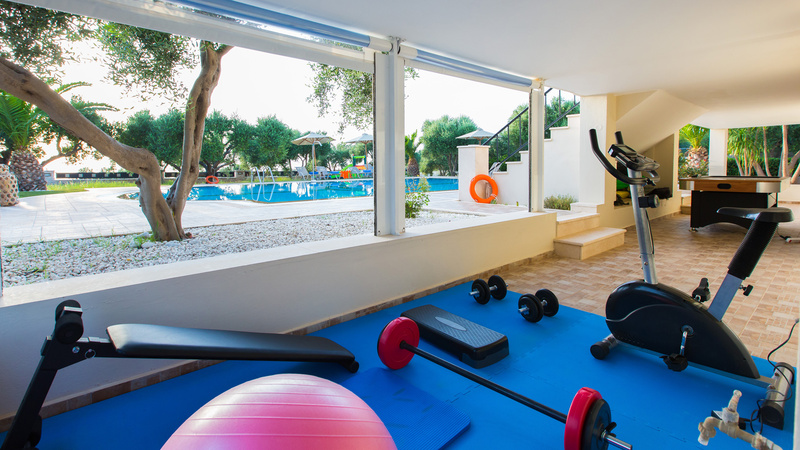 - A variety of indoor and outdoor facilities! 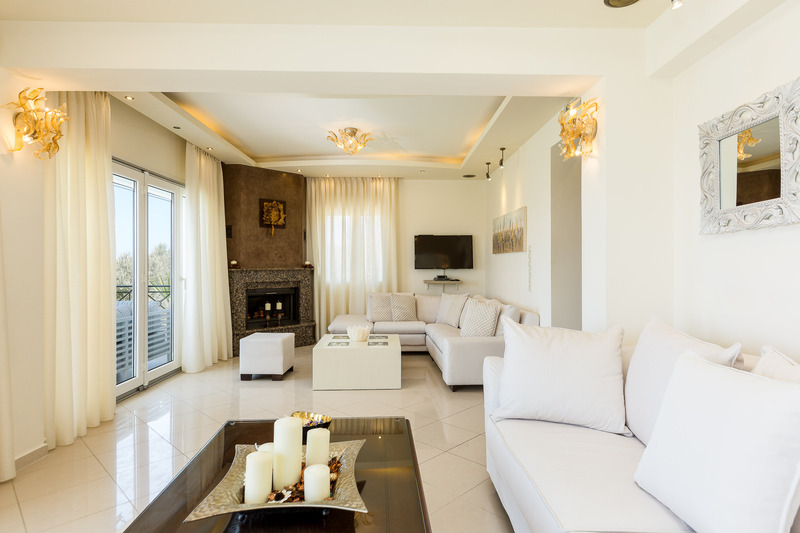 The house provides everything for the relaxation and comfort of 10 people. - Several extra services on request. - Hospitality! The owners will be on hand to help and give you any advice required. 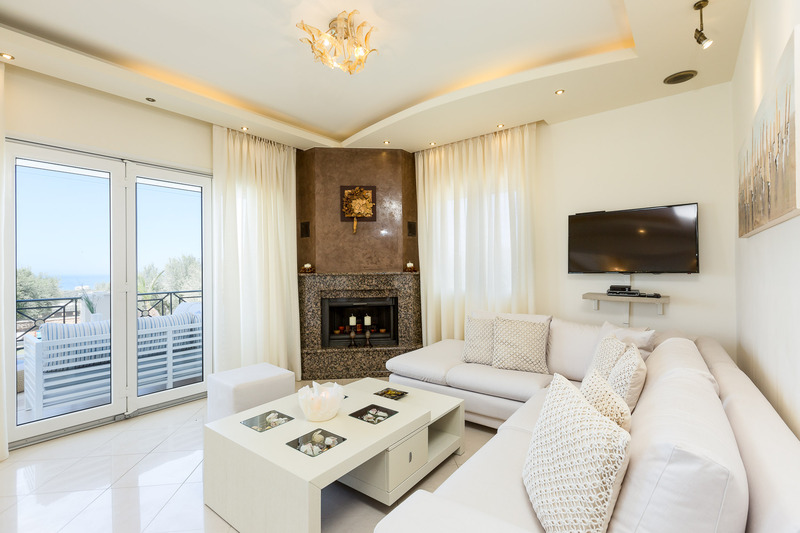 On the first floor, there is a spacious open plan living room area with satellite HDTV and a fireplace. 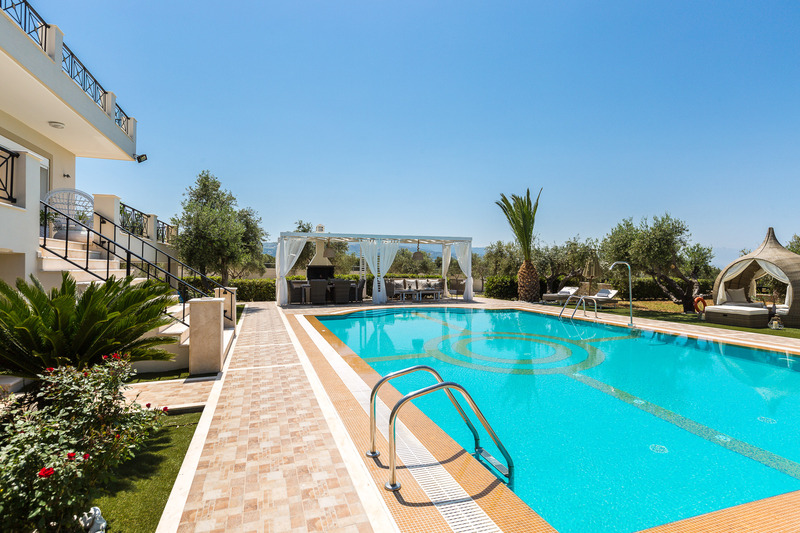 This area has direct access to the central veranda and the pool. 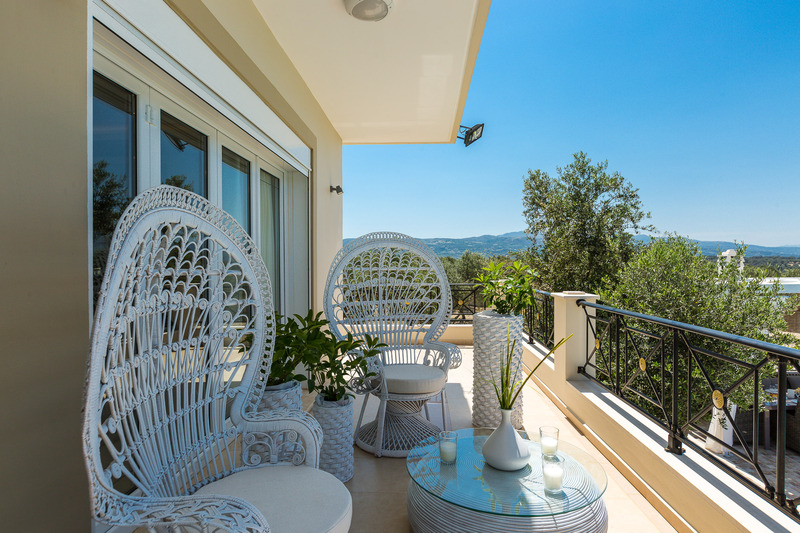 From the veranda you can enjoy the view of surrounding area and sea! 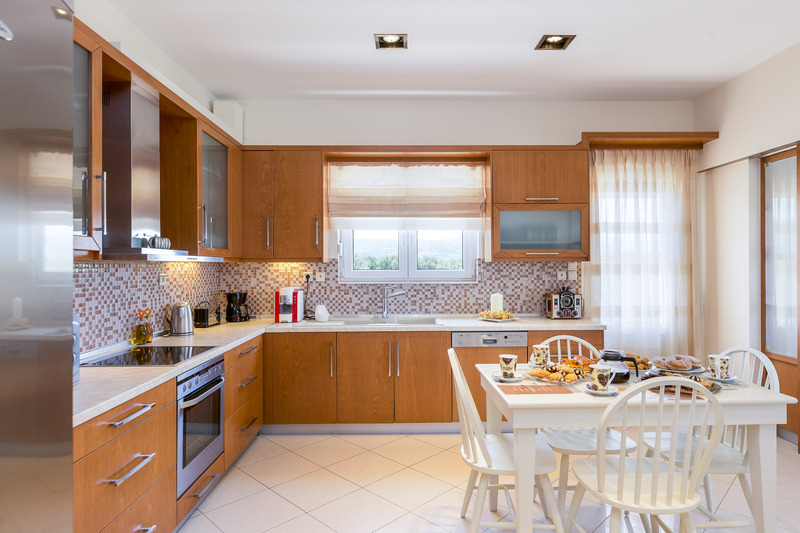 Next to the dining area, a fully equipped kitchen makes sure that you have all that is needed to prepare your homemade meals. 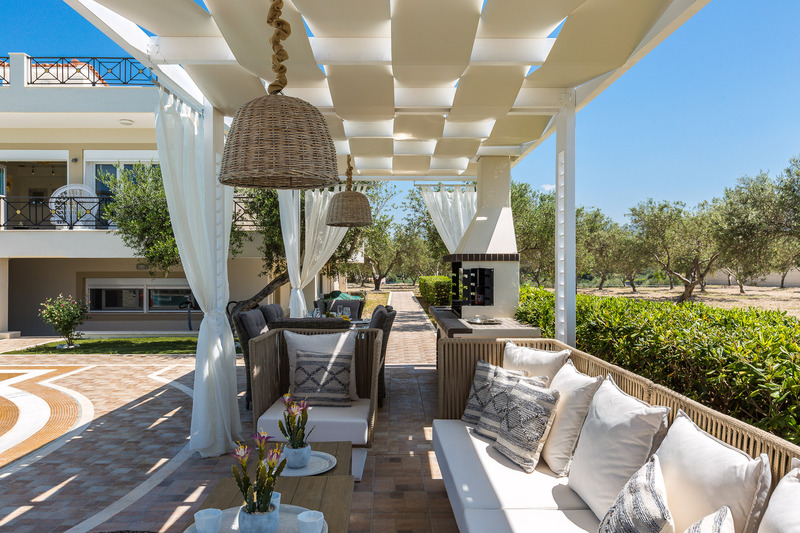 Barbecue facilities and an outdoor dining table under the shade of the pergola give you ample opportunity to try al fresco dining, while an extra shaded siting area and a gazebo are also available. 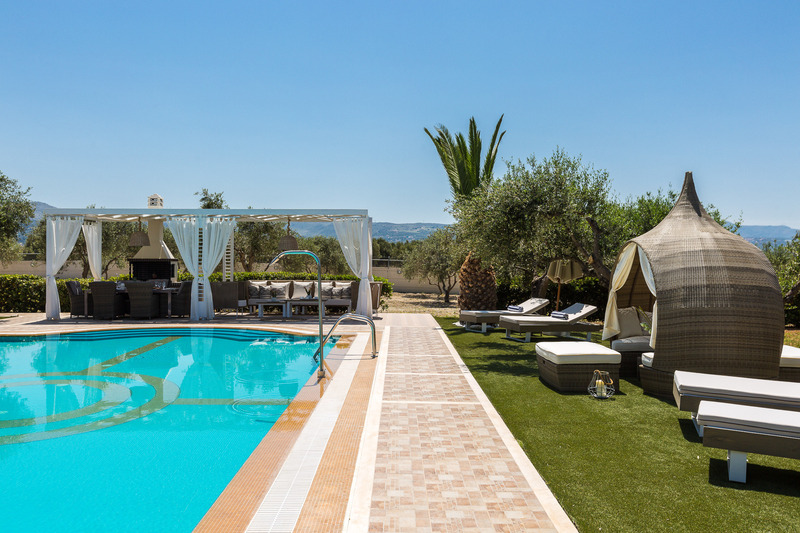 On the other side of the pool a lawn covered area with a playground and toys under the olive trees is at the disposal of our young guests, while on a covered part of the ground floor veranda, by the pool, an air hockey, mini football table, as well as gym equipment including a bicycle, wights and an exercise bench. 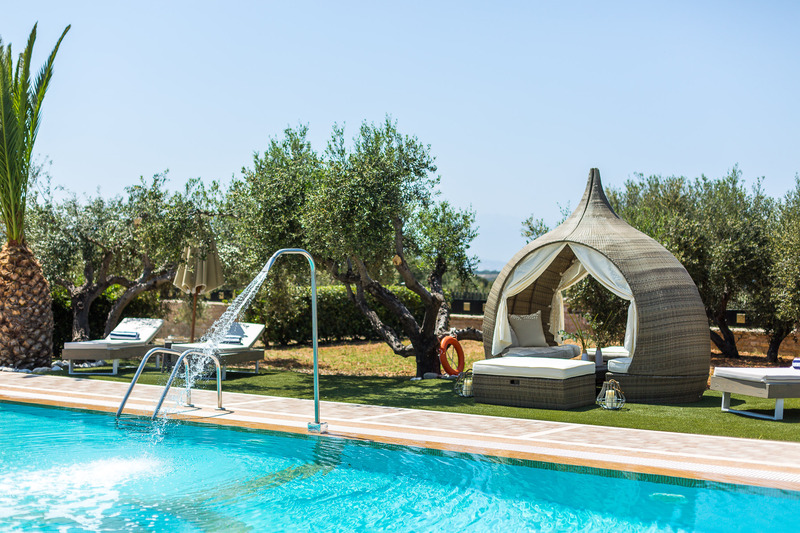 A playground and toys under the olive trees is at the disposal of our young guests.